Gourmet Pigs: GIVEAWAY: A Box of King's Hawaiian Bakery Awesomeness! GIVEAWAY: A Box of King's Hawaiian Bakery Awesomeness! In yesterday's post I talked about touring King's Hawaiian Bakery, tasting many many things made using their products, and about the box of goodies I got as a parting gift. 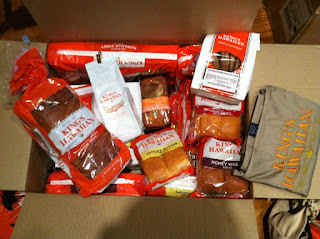 The giant box had bread enough for months, coffee cake, coffee, cookies, apron, gift card, etc ... and we bloggers loved it so much King's Hawaiian decided they wanted to share the aloha with you guys! So ... we will be giving away a similar box (the contents won't be exactly the same but I'm sure they will be just as generous!) to one of my readers! 1. Leave your name and email contact in the comments below and answer the following: Have you had King's Hawaiian Bakery products before, and if so, which one is your favorite? 2. Share this giveaway on Facebook, and make sure you tag my page @Gourmet Pigs so I know you actually did it! 3. Tweet "Win a box of @KingsHawaiian goodies from @gourmetpigs! #KHspreadsAloha http://bit.ly/SXCMmY"
You have until midnight of Tuesday, October 23rd. Good luck! My favorite are the butter buns; I leave four of them attached as a burger bun. The original Hawaiian sweet is what I grew up with! I love their buns and multi-layered cake! I think I've only had the original sweet rolls too, but they were my favorite growing up. Wouldn't all that bread go stale? I love the regular round Hawaiian Sweet bread. Its my ultimate comfort food especially when I'm sick. paradise cake! and also their original sweet bread. SO good! I always use the Original Hawaiian when I make sloppy joes! Amazing! I like to eat the original Hawaiian sweet with peanut butter (grew up eating that kind of stuff). There's a place here called Dog Haus that serves hot dogs and burgers/sliders in these... divine!! I tweeted this giveaway (and my gmail handle is nobel4lit2). i've had their rolls before - fluffy heaven! I like to use the dinner rolls for Spicy Pulled Pork sliders with Asian Peanut Slaw. Perfect with a margarita. I looooooove their original Hawaiian sweet rolls! I like sweet rolls, so delicious. I've tried their bread and dinner rolls, and like them both, but the rolls are my favorite. Okay, the only thing I've tried is the original sweet because I've only had good experience with them. Love them with butter and maple syrup! I don't have a favorite. There's no way to choose. You can eat King's Hawaiian with anything and everything. It was love at first bite for the Hawaiian sweet rolls! Hope this works. Experiencing problems in sending this. I have tried their products and love the original sweet mini sub rolls. They are perfect for making a snack. I love the original sweet buns the best! My favorite are the dinner rolls - we can not get enough in this family!